JustHost offer shared hosting. They don’t offer any other types of hosting, making shared hosting their primary and sole focus. Although this might not suit every user, it certainly strikes me as a positive thing. If this web host only caters for one market, that’s got to be a good product right?JustHost pride themselves as an affordable web host. They provide easy integration with a simple approach. One of the first things you’ll notice about JustHost is the price. Admitedly, there are cheaper web hosts like BlueHost. But, the prices are far from unreasonable! Especially considering that the Plus and Prime plans are both just £5.33 per month at the moment. The Basic plan is indeed basic, but it’s plenty for a personal or blog user. 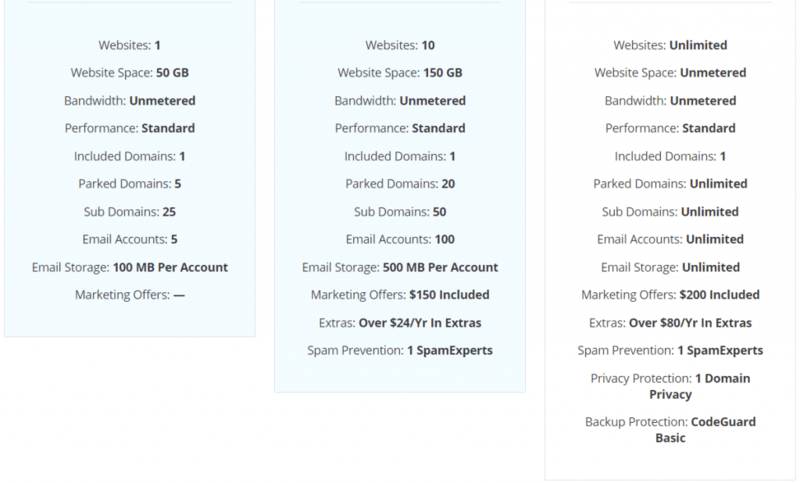 You’ll get unmetered bandwidth, a free domain included, and 5 email accounts with 100 MB storage per account. With cPanel, you’ll get access to Softaculous which will include apps like WordPress, Joomla, and Drupal. Unlike the Plus and Prime plans, the Basic plan doesn’t come with any marketing offers. You won’t get any extras, spam prevention, privacy protection, or backup protection. The Basic plan is ideal for users who have just created their first website, or own a blog or portfolio. For an extra £2 per month, the Plus plan offers 150 GB web space, more email accounts, more domains and a total of 10 website. Marketing offers now come into the equation, offering users $150 of marketing credits for free! This is a great bonus, especially if you’re looking to get more traffic to your website. You’ll also have 1 SpamExperts account which covers email filtering, spam and virus protection, and more. The Prime plan, currently at the same price as the Plus plan, offers many more features. Pretty much everything is unlimited, including email accounts, bandwidth, disk space, etc. You’ll receive $200 in marketing credits, SpamExperts, Domain Privacy, and CodeGuard Basic. For only £11.47 per month, it’s well worth the extra if you need the added performance. I’d say the Pro plan is definitely more tailored towards larger businesses or eCommerce customers who rely on a bit more oomph. Setting up a new hosting plan with JustHost is pretty simple. The interface is intuitive and user friendly, making it a great option for beginners and professionals alike. Once you’ve selected your package and your domain name, you’re presented with your payment options. The account plan selection automatically defaults to the cheapest price, with a 36 month contract. As can be seen, there’s no setup fee, which we wouldn’t really expect from a web host anyway! What does frustrate me, and lots of hosts do this, is that the additional extras are ticked by default. When I get to the checkout, I want to decide for myself, as a user, whether I want optional extras. cPanel is one of the easiest and most common control panels you’ll come across in the web hosting industry. It’s popular and familiar amongst users, and there’s a good reason why. cPanel gives you the option to register and manage domain names, all in one place. So, if you get a domain name with your web host, it can make things a lot easier. You’ll be able to access the marketplace which will give you a view of all the exciting things you can install onto your website. For example, you can install CMS platforms like WordPress, Magento, and Joomla. You can also install plugins and manage emails, email accounts, and much more. 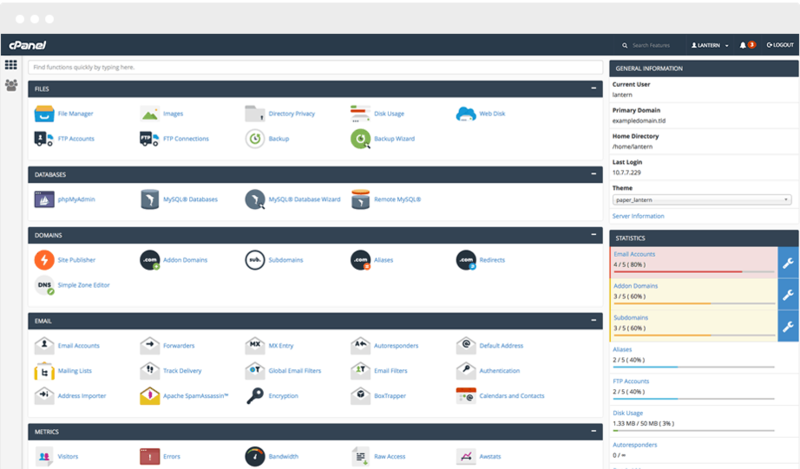 Why not give it a go yourself and try out cPanel’s demo here. All of JustHost’s site owners will be able to enjoy CloudFlare CDN free of charge. All you need to do is simply enable the CDN via your cPanel – it’s really simple. Now I bet you’re wondering what a CDN does! A CDN caches your website content. The purpose of this is to ensure that users who are visiting your website, globally, can access your content at the same speed. So, if your server is based in the U.S.A. and your users are based in the U.K., they’ll be able to access your website content at the same speed and performance as a U.S. based visitor. User experience is vital when it comes to managing your website. The 2018 standards recommend that your website loads within 3 seconds. With the world becoming mobile, it’s important that your website performs well on mobile and desktop, to all available users. JustHost provide daily backups for free. They do offer a paid service that opens up a range of features, but for now, we’ll focus on their free option. When you’re managing a business or a website, it’s common for you or your webmaster to make changes to your site. eCommerce businesses will store customer details and orders in their databases, etc. However, it’s also possible that human error can occur, and even server errors. If this happens, your run the risk of losing your website’s data if you don’t create regular backups. A web host that provides a backup plan for free is a real bonus. Although JustHost say they can’t guarantee that backups will happen, they do offer extra (affordable) services that do guarantee backups. Well worth the investment in my opinion! The difference between a good web host and a great web host, for me, is server uptime. When you’re running a business, or trying to generate traffic to your website, uptime is incredibly important. How frustrated would you be if you visited a website and there was no data to see because the site was down? I signed up to JustHost’s shared web hosting to get some real data and information about their server’s uptime. 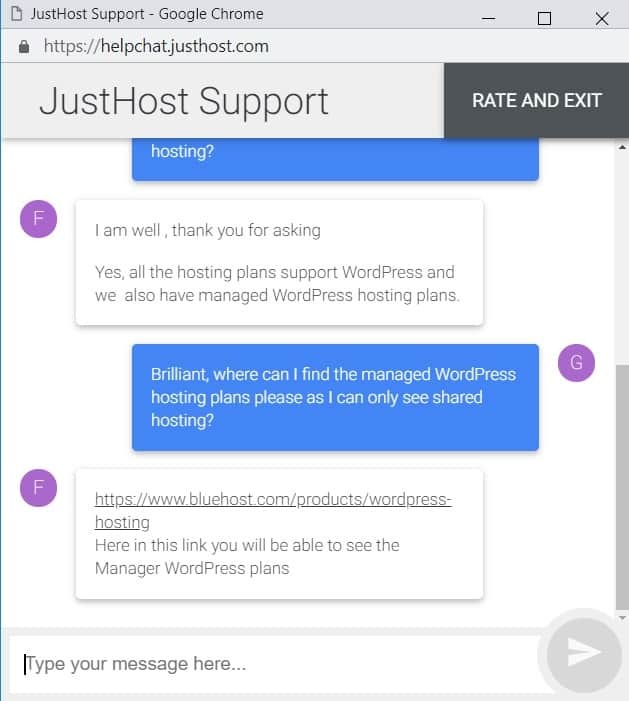 Hopefully this will give you a good insight into whether JustHost is the right web host for you too! Since the beginning of 2018 I’ve been monitoring my website’s uptime with JustHost. I’m really pleased to report that over the last 8 months, I’ve enjoyed a 99.98% uptime experience! The industry ‘average’ is around 99.94%, so these results exceed expectations. Although JustHost don’t actually guarantee an uptime, they do state “Just Host is committed to providing a secure and reliable hosting environment“, which I think they’ve certainly achieved (in my experience anyway)! Although JustHost doesn’t advertise a specific eCommerce plan, you can add eCommerce features to any of their shared hosting packages. Once you’ve completed the checkout process, you can visit the marketplace where you can install a multitude of apps for free. Apps include the likes of ShopSite, Magento, and OpenCart. These apps make it easy to add products to your shop, create branding, associate payment types, etc. It’s really important you have a decent backup plan with an eCommerce site, as losing all of your data would not be good! 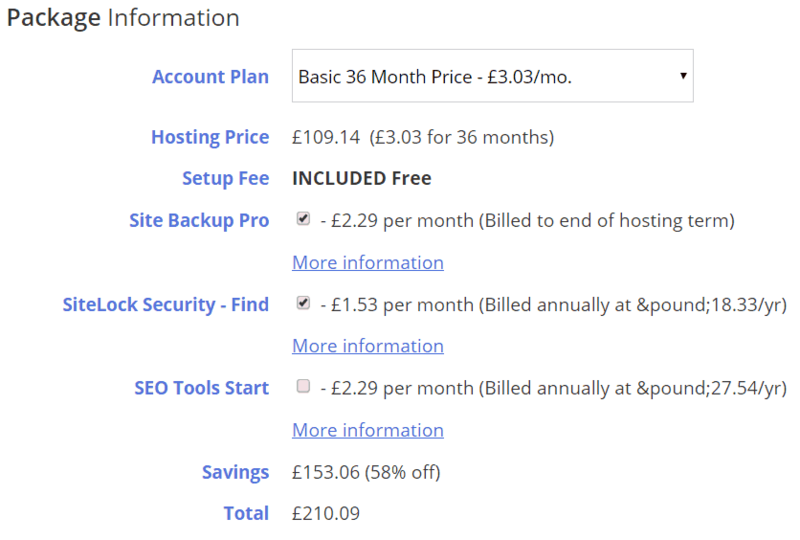 JustHost offers a basic backup plan for free, but you can opt to pay £2.29 per month for Site Backup Pro which I would recommend in this case. You’ll get more options to backup individual files and folders, as well as daily runs and scans. JustHost are easily contactable 24/7 via email, ticket, phone, and live chat. I contacted their telephone support, which is U.K. based, and was pleasantly surprised how quickly I was connected with an agent. They were friendly and helpful, and resolved my query within a matter of minutes. Next up I tried out their live chat. The live chat module is the same as BlueHost’s, making it easy to use and familiar. I was connected with an agent in less than 4 seconds which was pretty astounding! The agent was again helpful and friendly. Top marks from me for their customer support! JustHost is a web host who provide lots of features and fun extras, balanced with affordable pricing. For this reason, I highly recommend them as one of the best mid-range hosts in terms of price and affordability. Their services are easy to use and simple to get the hang of. Once you’ve signed up and have access to your account and control panel, you may be surprised at how user friendly the whole process is (even for beginners)! Whether you’ve never used a web host before, or you’re an expert in the field, you’ll be able to enjoy their generous data storage space, unlimited bandwidth, and pool of email accounts. Oh, and not to mention, the free domain name you’ll get too (that’s a bonus for everyone). JustHost may be missing a few popular features like an uptime guarantee or free SSL certificates, but they certainly make up for this through their well-balanced pricing plans. If you plan to commit long-term to JustHost, you’ll reap the rewards of a cheaper plan. Understandably, this may not be the best option if you’ve never used a web host before, but remember they do offer an anytime money-back guarantee.